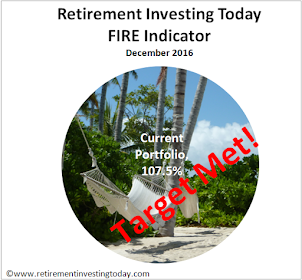 Within my Retirement Investing Strategy I currently hold 2.6% of my portfolio in gold with a targeted holding of 5%. 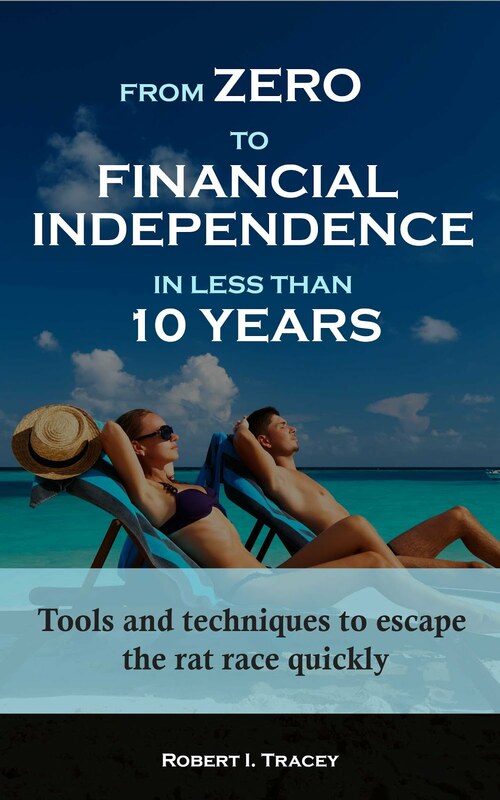 Gold is the only portion of my portfolio that does not provide some sort of yield (dividends, interest etc). So why do I hold it? 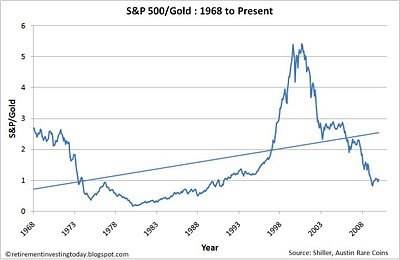 The first chart shows the Real price of gold since 1968 with it becoming quickly obvious that it can be a wild ride. The first reason I hold gold is demonstrated by drawing a trend line through the dataset which provides the formula Real Price = 1.37 x Year -2120. 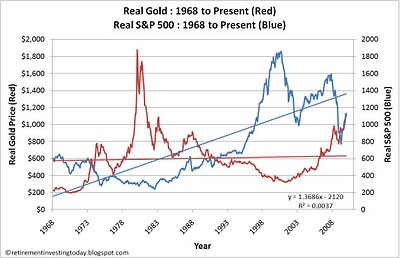 This suggests a trend Real price in 1968 of $573 and a trend real price in 2010 of $630. So provided you don’t buy during one of the scary boom periods this suggests that gold has the potential as a good long term place for me to protect myself from inflation. The second and very important reason I hold gold is that the correlation between the Real S&P 500 (also displayed on the first chart) and Real gold is negative at -0.34. The second chart provides the ratio of the S&P 500 to gold demonstrating just how far apart the two can vary. So my thought here is that there will be some opportunities where stocks will be overvalued but gold will be cheap (and I can buy) and vice versa. Over the long term maybe I can then squeeze some more performance out of my portfolio. But Gold is price when it is out of resources.